Have you ever noticed mushrooms in the lawn after a rainstorm? It seems like they sprouted overnight, and perhaps they did. Mushrooms are the fruiting bodies of fungus. They are the part of a fungus that allows new fungi to grow. They’re not plants, but an entirely different organism. 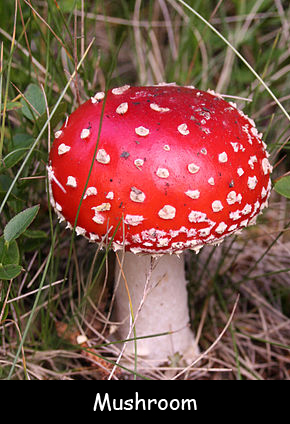 Mushrooms are highly nutritious, but not all mushrooms are edible. Many are poisonous and some can even kill you. Mushrooms are almost entirely water, yet they’re a good source of B vitamins, selenium, and potassium. Mushrooms have more in common with humans than with plants. They have their own immune system, for example, and can produce vitamin D in their cells when exposed to the sun. Some mushrooms glow in the dark. Anciently, people carried these mushrooms to light their way through the forest. Mushrooms break down organic matter for food. The Honey Mushroom in the Blue Mountains of Oregon is the world’s largest organism. This mushroom colony is believed to be at least 2,000 years old. It covers almost four square miles. There are thousands of kinds of mushrooms. At the store, you’ll probably find five or six different kinds. Button mushrooms are the most common mushrooms sold in grocery stores. Some people are experts at harvesting wild mushrooms. They know which ones are edible—and which ones are toxic. Question: Do farmers grow mushrooms? Answer: Yes, although mushrooms don’t grow in fields like other crops. They need a food source, such as wood or compost, and they’re often grown indoors in wooden boxes. Watch a video about growing mushrooms. Declan, Tobin. " Mushroom Facts for Kids ." Easy Science for Kids, Apr 2019. Web. 21 Apr 2019. < https://easyscienceforkids.com/mushroom/ >.